Ross’ quiet voice and gentle demeanor made him the perfect host for The Joy of Painting, but those traits might have kept him from being the perfect soldier. Before Ross became a TV painter, he spent 20 years in the United States Air Force and retired with the rank of master sergeant. In fact, an early assignment to Alaska helped expose the Florida native to the snowy mountains and evergreens that would become staples of his art. When Ross retired from the Air Force, he allegedly vowed never to scream again, a plan that seems to have worked perfectly. The Joy of Painting ran new seasons on PBS from 1983 to 1994, so even at public broadcasting rates the show must have made Ross quite a bit of loot, right? Not quite. 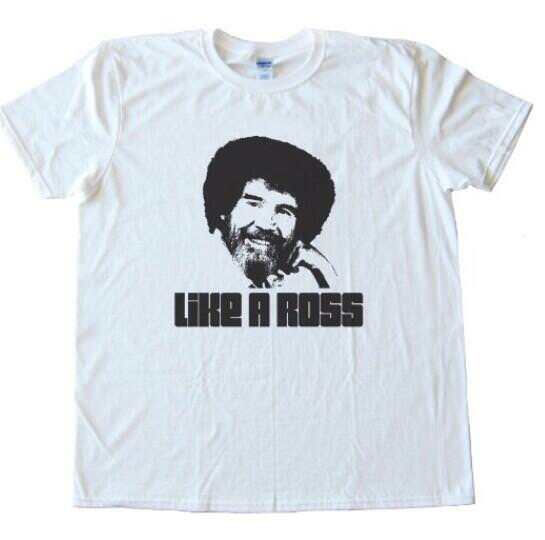 Ross actually did the series for free; his income came from Bob Ross Inc. Ross’ company sold art supplies and how-to videotapes, taught classes, and even had a troupe of traveling art instructors who roamed the world teaching painting. It’s tough to think of a better advertisement for these products than Ross’ show. How did Ross find the time to tape all of those shows for free? He could record a season almost as fast as he could paint. Ross could bang out an entire 13-episode season of The Joy of Painting in just over two days, which freed him up to get back to teaching lessons. In a 1991 interview with the New York Times, Ross claimed he’d made over 30,000 paintings since he was an 18-year-old stationed in Alaska with the Air Force. When Ross died of lymphoma in 1995, most of his paintings either ended up in the hands of charity or PBS. Before he ever picked up a paintbrush, Ross was an animal lover. During his childhood in Florida, he once shocked his mother by trying to nurse a wounded alligator back to health in the family’s bathtub. Throughout his adult life, he maintained his soft spot for animals; his Florida home usually housed any number of critters that Ross was trying to help rehabilitate. At various times he played host to birds with broken wings, orphaned baby squirrels, and an epileptic squirrel that lived in his empty Jacuzzi. Ross liked animals so much that he would tape squirrels in his backyard. During the early 1990s, Ross had hoped to develop a new non-painting show that would introduce children to a variety of new wildlife. It’s hard to think of Bob Ross and not immediately key in on the giant bushy mushroom cloud of hair that exploded off of his head, and Ross knew it. Unfortunately, he also supposedly hated the haircut. Ross had an uncanny knack for marketing, though, so he knew that trimming his locks down to a more conservative ‘do would probably undercut part of his business. Ross decided to stick with his trademark look and even had his permed visage emblazoned on every tube of Bob Ross Inc. art supplies. Is anyone pulling his schtick on youtube?